Jurys Inn Bradford01274 848500work Group AccommodationA brand new City Centre hotel located close to Centenary Square and City Hall. 198 air conditioned rooms with free Wifi and hardwired internet access in each room. All rooms have a plasma TV with built in freeview TV and fantastic blackout curtains. All rooms have at least a king sized bed - twin rooms have one king size and one single bed. The hotel has three fully equipped conference rooms on the first floor with 50"""" plasma TVs, LCD projectors, drop down 8ft screens and all the equipment you'll need for a successful meeting. We also have a specific refreshment breakout area on the same floor. 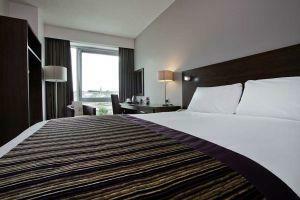 A brand new City Centre hotel located close to Centenary Square and City Hall. 198 air conditioned rooms with free Wifi and hardwired internet access in each room. All rooms have a plasma TV with built in freeview TV and fantastic blackout curtains. All rooms have at least a king sized bed - twin rooms have one king size and one single bed. The hotel has a modern restaurant and bar that sells a large variety of beverages, snacks and meals - something for everyone and all served in fantastic surroundings.